"This is one of my husband's favorite meals." Mix salmon, panko, parsley, eggs, green onions, seafood seasoning, black pepper, garlic powder, Worcestershire sauce, Parmesan cheese, Dijon mustard, and creamy salad dressing together in a large bowl; divide and shape into eight patties. Heat enough olive oil in a large skillet to cover the cooking surface over medium heat. 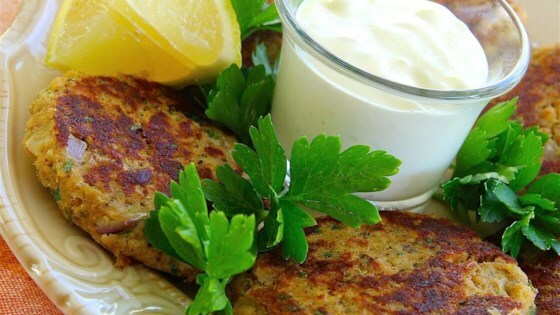 Fry salmon patties in batches until browned, 5 to 7 minutes per side. Repeat with more olive oil, as needed. This is an old family favorite. My mom used crushed soda crackers in place of the panko, but both ways are yummy. super yummy. I didn't have all the ingredients for it but it was still great. The best salmon cake recipe I've ever tried. Didn't change a thing. Thank you for sharing. I've been making different variations of this for years! My husband and I both love them. I often add a little butter to the skillet, and sub coconut oil for the evo.